It is the traditional carts that gain attraction in any event we organize. We give you the opportunity to offer something special and unique to your friends and guests that will never forget based on Dodoni’s superb flavors of ice cream and sweets. Ideal for weddings, christenings, dinners, children’s parties and dances. 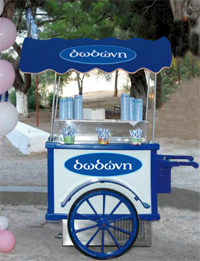 Beside the variety of flavors of Dodoni’s ice cream, the complete service includes shipping and handling at the time and the place you indicate to us, complete dressing of waiters in Dodoni’s suit for serving ice cream and providing with all the necessary consumables such as cups, spoons, napkins, etc. Also from this year and on, we cater certain occasions you indicate us with fresh sweets you choose from the wide range available from Dodoni.